Booking: The LSM510 microscope can be booked by trained users only. 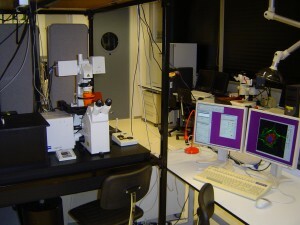 To book the microscope Ronald Breedijk (+7860) should be contacted. The measurement schedule will be published in the webcalender on Thursday, the week before. For first time-users contact Ronald Breedijk (+7860). Software: LSM files can be viewed and processed with the LSM AIM software (dongle required), the free LSM ImageBrowser software or exported to other standard formats. The Loci plugin can be used to import the files into ImageJ.